Charon is a dynamic, interesting world in its own right, and even more interesting when directly compared to the dwarf planet Pluto. Soar over the bizarre terrain as you learn more about the weird and wonderful geomorphology of this not-so-little moon. 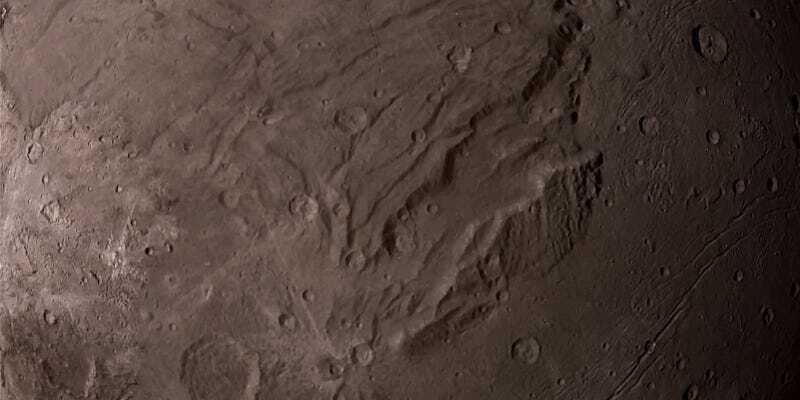 Charon took us by surprise with its collection of complex landscapes. From oddly barren patches with just a handful of craters to deep, gouging chasms that put the Grand Canyon to shame, this was not the dead little moon we’d envisioned it would be from our first long-distance peeks. The latest release from the New Horizons flyby of Pluto and its moons includes this lovely colour mosaic of the highest-resolution snapshots we’ve received of the landscape to-date. So, what’s going on? The most notable feature is an epic chasm lined with equally-epic cliffs. While it’s hard to get a sense of scale from an isolated rockball in space, that crack in the world runs 1,000 kilometers (600 miles) long and up to 7 to 9 kilometers (4 to 6 miles) deep. A series of smaller semi-linear trenches to either side seem to follow the same general orientation, making me wonder about regional stress features. To the southeast of the chasm, the terminator is encroaching on a cratered, older surface, marked by the scars of long, linear trenches formed by yet-to-be-determined processes. It is also home to an odd little mountain perched in a moat. To the northwest of the chasm, the crater density decreases and each of the craters are less clearly defined. The landforms seem more bumpy, with almost flow-like or spiderwebing textures. This makes me suspicious of a possibly younger landscape. The reason behind the changes in colouration are also yet-to-be-determined. At least one darker patch seems to be centered on a crater, and another may be lipping a crater rip. The lighter, brighter patch is a network of cracks and craters in a rougher terrain, but far less densely cratered than the region creeping into the nightside of the moon.